Scott, a UNC grad and former ABC11 intern, was laid to rest Saturday in Raleigh. 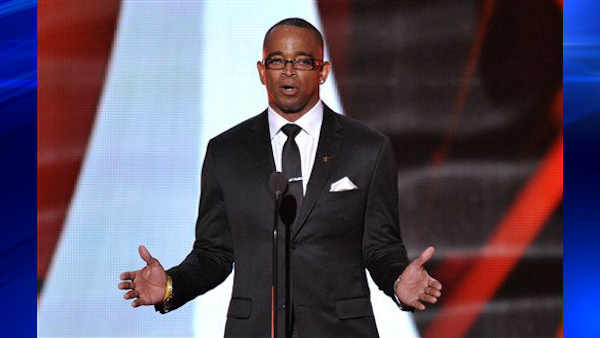 RALEIGH (WTVD) -- Stuart Scott's family requested privacy for his funeral, and we respected their wishes. Mourners who entered the Providence Baptist Church included multimedia sports personality and pundit Stephen A. Smith. Everyone had to pass signs outside the church that said, "No video, no cameras, no interviews." I worked on a draft of my report about his memorial service. My source material included a story Caitlin Knute filed a few years back when Scott made one of his annual appearances at the Jimmy V Celebrity Golf Classic. He told her that while he participated in many similar charity events, "This one's special because I've been doing it longer than any one there. I think 15, 16 years. Because of my fight with cancer and the people I've known, year in and year out. It's homecoming for me." I also referenced Larry Stogner's praise for him when our newsroom assembled sources for Angelica Alvarez's report last weekend on Scott's death. When asked about his influence, Scott would cite the thrill of writing a script while he was an intern from UNC-Chapel Hill, a script that Larry read on the air after correcting just one word. Larry said that when the aspiring reporter came in to learn from us, "We knew Stuart was going to make it somehow. We didn't know he was going to end up being 'Stuart Scott,' but we knew he was going places, and he did." Most mourners left the funeral without comment. But sports journalist Tessa Rogers, who considers Scott a mentor, came up and told us they heard inspiring words about him during his funeral: "The values that his family bestowed upon him. Most of the people who spoke said the same sentiment that he never wavered from his upbringing and his character." She shared the program from the service with us. On the back, there's a message that is attributed to an anonymous author, but it certainly sounds like something Scott would have said to the world. "When I die if you need to weep/Cry for your brother or sister/Walking the street beside you/And when you need me put your arms around anyone/And give them what you need to give me./I want to leave you something/Something better than words or sounds./Look for me in the people I've known or loved."